Start off your visit on the 9th (Thu): let little ones run wild at Muddy's Playground. To find maps, traveler tips, reviews, and tourist information, read our Cairns driving holiday planner. Auckland, New Zealand to Cairns is an approximately 8.5-hour flight. Due to the time zone difference, you'll gain 2 hours traveling from Auckland to Cairns. Traveling from Auckland in May, expect nights in Cairns to be somewhat warmer, around 24°C, while days are much hotter, around 32°C. On the 11th (Sat), you're off toPort Douglas. Family-friendly places like Scuba & Snorkeling and Four Mile Beach will thrill your kids. And it doesn't end there: look for all kinds of wild species at Hartley's Crocodile Adventures, meet the residents at Wildlife Habitat Port Douglas, get great views at Flagstaff Hill Lookout, and look for gifts at With Sugar. To see maps, where to stay, reviews, and more tourist information, refer to the Port Douglas travel planner. Traveling by car from Cairns to Port Douglas takes 1.5 hours. Alternatively, you can take a bus; or take a shuttle. In May, plan for daily highs up to 32°C, and evening lows to 24°C. Wrap up your sightseeing on the 13th (Mon) to allow time to travel to Cape Tribulation. 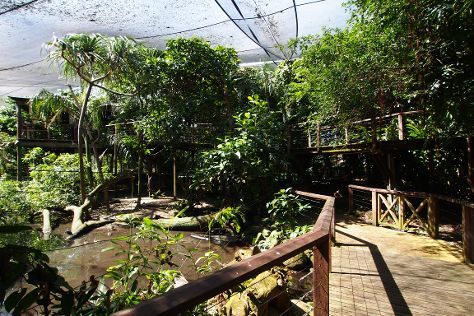 Kick off your visit on the 14th (Tue): admire all the interesting features of Daintree Tea, then engage your brain at Daintree Discovery Centre, and then delve into the lush surroundings at Daintree Rainforest - Cooper Creek Wilderness. To find traveler tips, where to stay, and other tourist information, refer to the Cape Tribulation holiday builder website . You can do a combination of car and ferry from Port Douglas to Cape Tribulation in 2 hours. Another option is to take a bus. In May, daily temperatures in Cape Tribulation can reach 32°C, while at night they dip to 24°C. On the 15th (Wed), you'll travel back home.